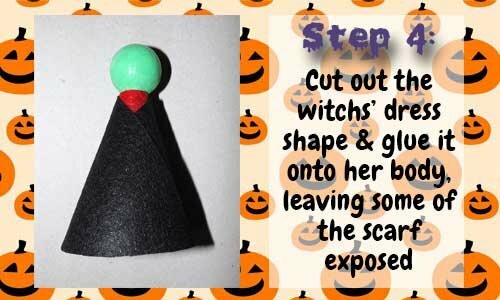 Cut your hat shapes (refer to the "What You Will Need" image - it is a ¼ circle shape and an "O" shape with a diameter of 5.5 cm) from the black felt. Using the craft or Styrofoam glue, stick the sides and together to form a cone. 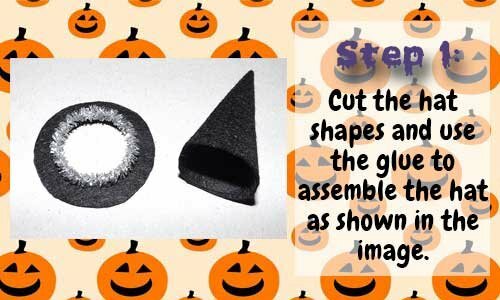 Cut a small piece of silver chenille stem and form into a circle (the same size as the widest part of your felt cone) and glue this to the hat rim. 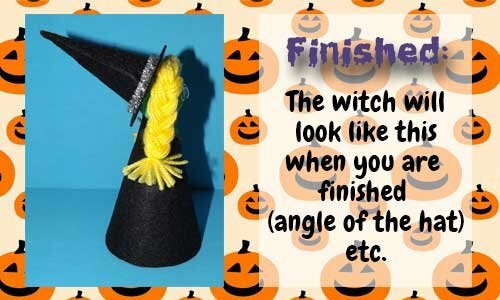 Then attach the cone shape to the hat rim inside the chenille stem ring. 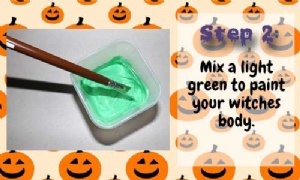 Using the green and white craft paint, mix a pale green hue and paint your entire angel shape light green. Give it two - three coats. From the red felt, cut your scarf shape (refer to the "What You Will Need" image again and you will see it is a soft "V" shape). 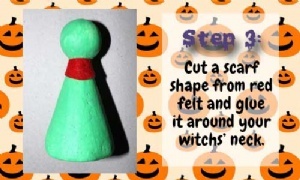 Glue this onto the witchs' body below her head. From the black felt, cut the dress shape (refer to the "What You Will Need" image again and you will see it is a large semi circle of about 20cm in length) and wrap the dress around the witchs' body (straight side closest to her head) and glue it down ensuring her scarf is peeking out. Plait the yellow wool/string to your desired length and glue her hair to her head, a little more forward than the centre. 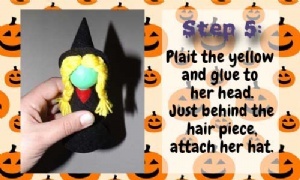 The hat will be glued down behind the hair so it is sitting at a slight angle behind the plait (refer to the last image in this DIY Tutorial). 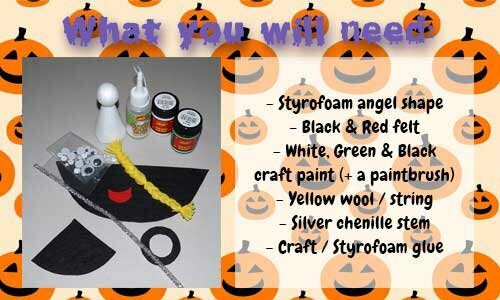 Lastly, stick her googley eyes on and using the black craft paint, paint her a mouth. You can paint her a nose too if you so choose. 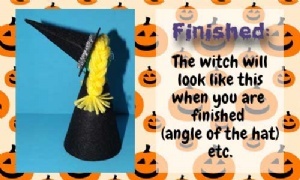 Use our witch as a guide, and customise your own features. Dont forget to share your creations with us on our Facebook Group. This item has 679 views.